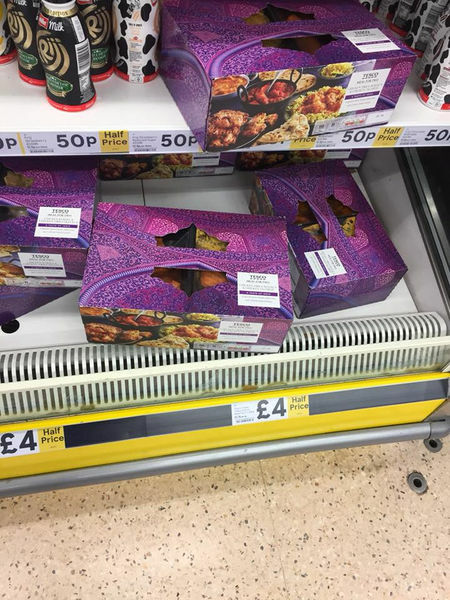 A bargain hunter has spotted Tesco is selling its popular takeaway box half price in one of its stores. Kyle Morgan shared the photo with the Latest Deals, Extreme Couponing and Bargains UK Facebook group. The photo quickly got the attention of fellow bargain hunters, gaining many likes, comments and people tagging their friends. The savvy shopper noticed Tesco's Indian take-away boxes were half price, reduced from £8 to just £4. The meal for two includes chicken korma, chicken jalfrezi, onion bhajis and naan bread. We spotted the deal is also available online. Eagle-eyed shoppers also noticed that Frijj milkshakes were in the photo reduced to only 50p, also half price. This comes as rumours circulate Tesco is making a new supermarket chain to rival the likes of Aldi and Lidl.